The theme for Book Week 2018 is ‘Find Your Treasure’. What a fantastically awesome topic that can be used in a number of different ways in the classroom or library. Book week will be celebrated from the 17 – 24 August and this year we have your back! We have created some of the coolest, most exciting activity ideas for book week. So without further ado, here are our book week activities for 2018! 1. 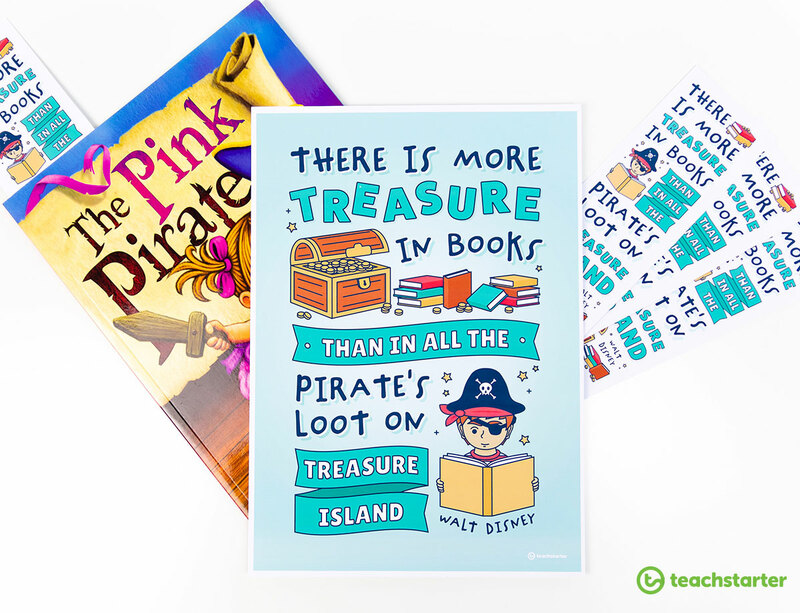 Create a class treasure chest of book titles that are treasured by students in your class. 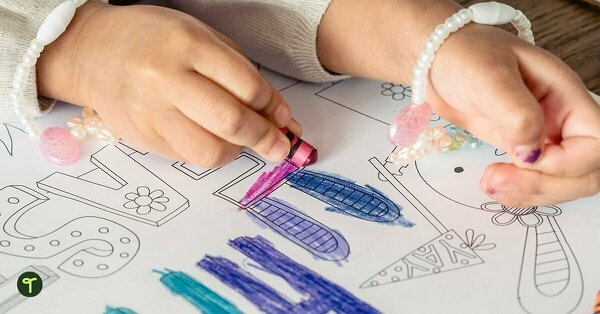 Download the My Treasure Chest Craft Activity. You may like to print the chest and coins on A3 pieces of paper if you are doing this as a whole class activity. 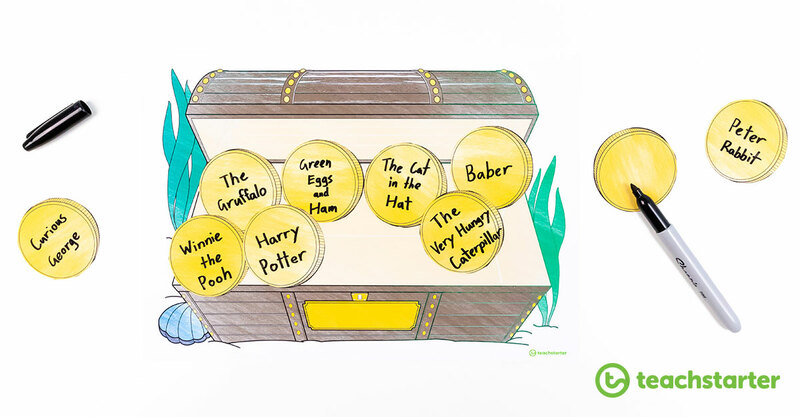 Each student in your class can write their most treasured storybook on a coin and add it to the class treasure chest. Alternatively, you can use this as an individual activity where each student writes a number of their favourite books to put in their very own treasure chest. After decorating it, they can then display this in the classroom or library. 2. Go on a book hunt in this beautifully illustrated image. Print out our Book Hunt Image or project it onto your whiteboard for your students. 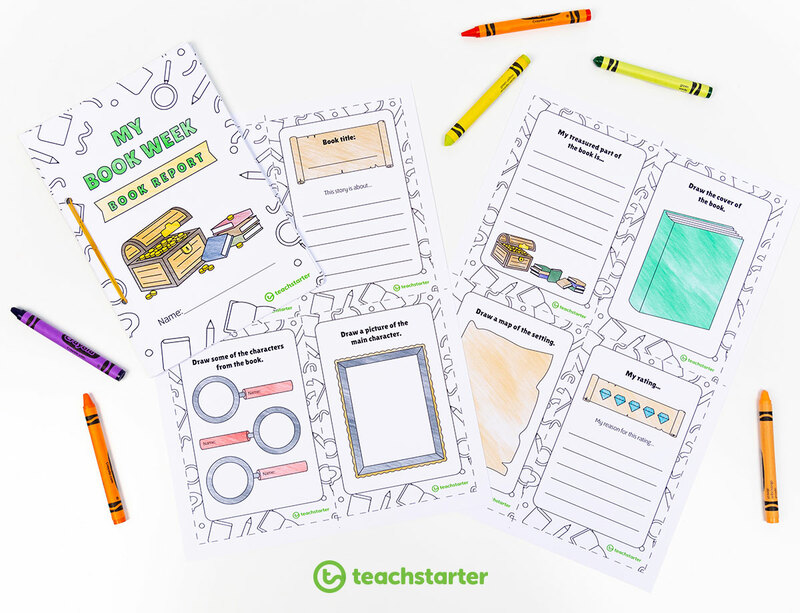 This could be a fun project that your class completes throughout the week, the perfect fast finisher activity or something to do in the last 5 minutes of a learning session. How many books can your class find in this image? Alternatively, in small groups, the students can try and solve each of the questions on the Book Hunt Task Cards provided. Green Eggs and Ham plus many more. If you’re a librarian, why not make this a whole school competition? Students need to write as many of the books that they can find to enter. The student that picks the most, is the winner – perhaps they could win a storybook? 3. Create a book report using one of the books on the shortlist for 2018. Check out the CBCA Shortlist of books and pick a selection of suitable book titles for your students. Alternatively, pick a selection of books that incorporate some sort of treasure as the theme. After your students have read a book, they can complete their very own book report using our My Book Week Book Report booklet. This gorgeous resource has a number of gorgeous connections to the Book Week theme – Find Your Treasure. 4. Give your students mini-challenges throughout Book Week. Use this set of 16 Book Week task cards through book week to explore the theme – Find Your Treasure. They are fun, engaging activities that your students will love. Plus, they can be used at any time during the year. Bonus! Imagine you find a treasure map hidden in an old dusty book that belongs to your grandmother. What do you think would be on the map? What would you do with it? Choose one of your favourite books. 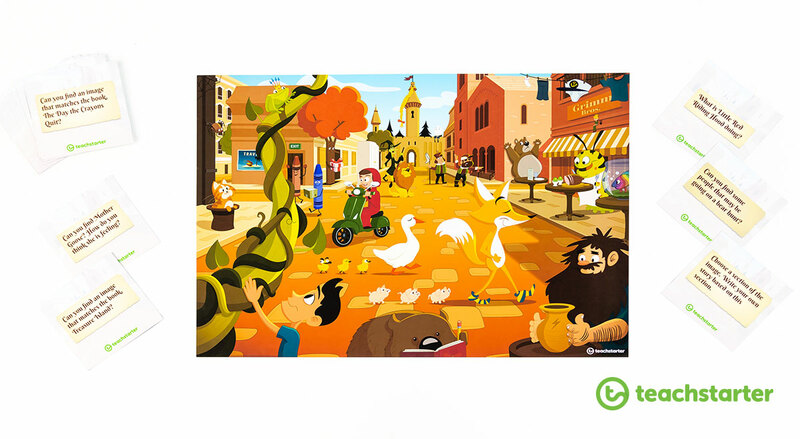 Create a scavenger hunt of words and pictures from the book for your friends to find. Imagine you are a pirate. Your treasure is your favourite book. Create a hiding place for your treasure. Draw a treasure map for your pirate friends to follow. Imagine the desk is your ship and the floor is the ocean. Create a pulley to lift your treasure out of the ocean and onto your ship. 5. 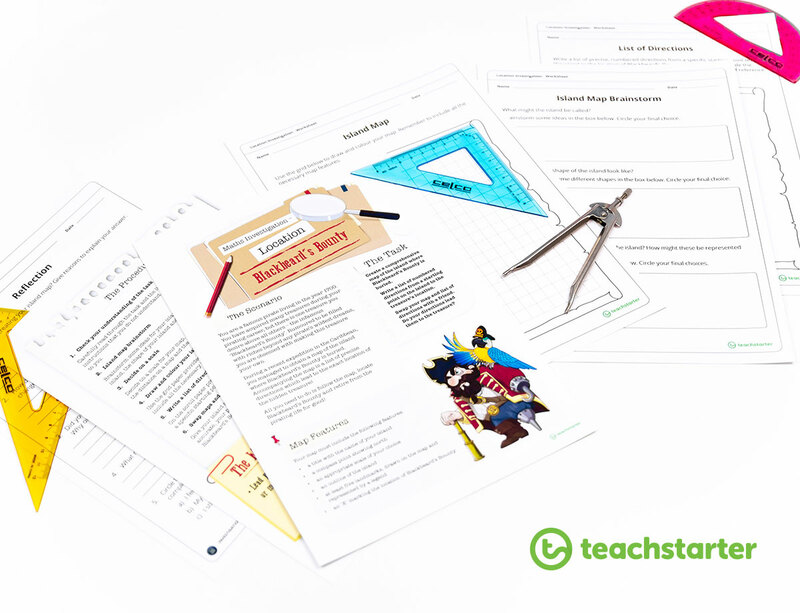 Have fun with this open-ended mathematics investigation featuring Blackbeard’s Bounty. Activities exploring the theme for book week can incorporate other learning areas as well. 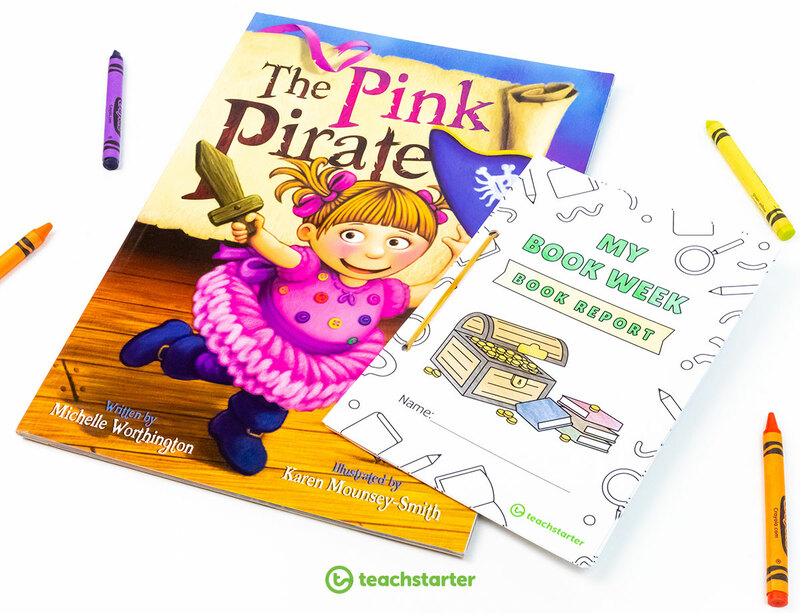 This fun location mathematics investigation involves students imagining that they are a famous pirate living in the year 1700. During a recent expedition in the Caribbean, they have managed to obtain a map (and accompanying set of directions) leading to the infamous ‘Blackbeard’s Bounty’ – a treasure filled with riches beyond any pirate’s wildest dreams! The students must create a comprehensive map of the island where Blackbeard’s Bounty is buried, write a list of numbered directions from a starting point on the island to the treasure’s location, then swap their map and list of directions with a friend. Hopefully, their directions will accurately lead to the treasure! 6. Read The Escape Key story and explore the task cards provided. 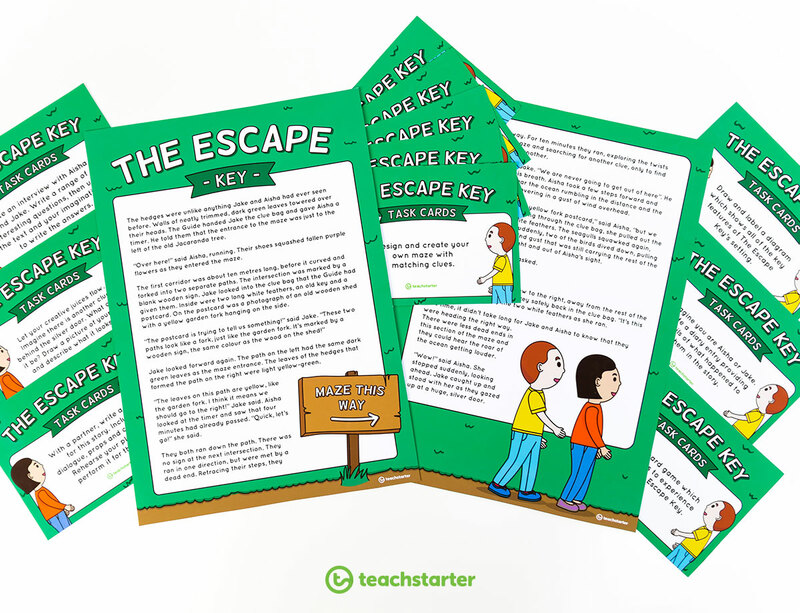 Download The Escape Key – Story and Task Cards. A fun story your students can read about two children escaping a maze using clues, but what could be behind the silver door? 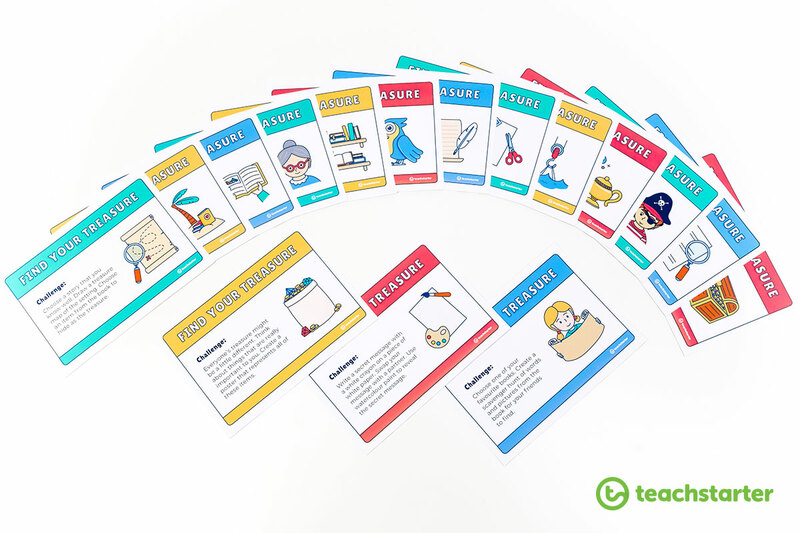 The task cards are the perfect addition to this story with some fun activities for your students to complete. Go outside and collect leaves, twigs, flowers and other items to create a collage of the maze. Let your creative juices flow. Imagine there is another clue behind the silver door. What could it be? Draw a picture of your clue and describe what it looks like. 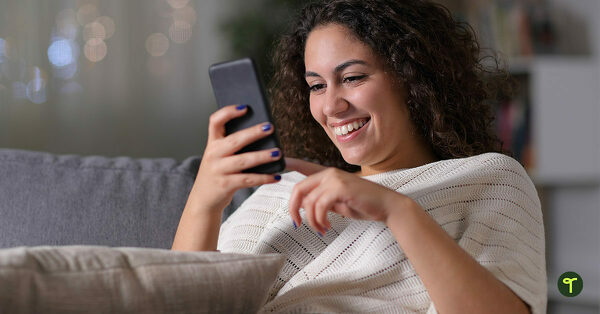 With a partner, write a script for this story. Include dialogue, props and costumes. Rehearse your play and perform it for the class. Draw and label a diagram which shows all of the key features of The Escape Key’s setting. 7. Go on a scavenger hunt around the school ending up in the library. 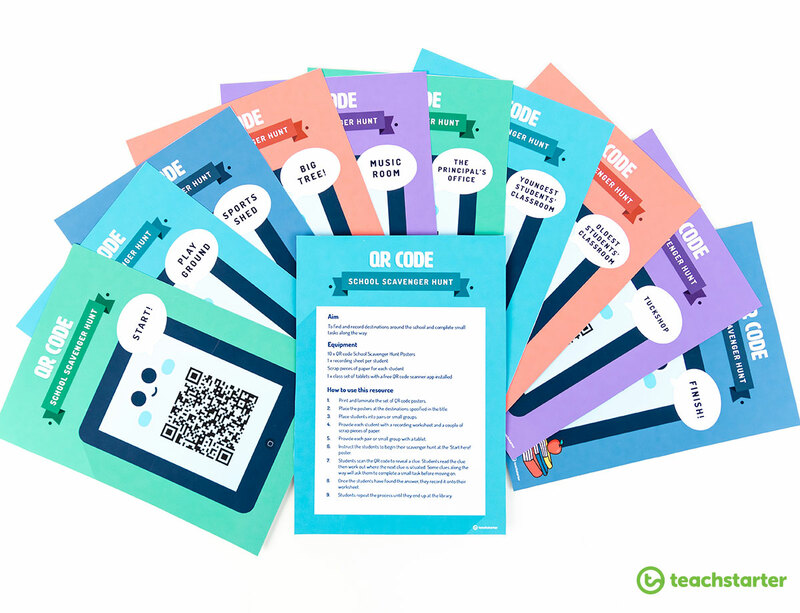 Your students will absolutely love this QR Code School to Library Scavenger Hunt activity. Once they make it to the library, they can pick a favourite treasured book to enjoy! If you’re anything like me, dressing up for book week is a must! Your students’ faces when they see you dressed up is always priceless! My favourite character was always The Paper Bag Princess! You can either go as your most favourite book character or try to pick a book character that suits this year’s theme. The obvious one is to go as a pirate, or perhaps Peter Pan! any of the crayons from The Day the Crayons Quit. 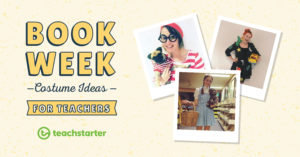 For more awesome ideas, read our blog, Book Week Costume Ideas for Teachers. I’m using the Treasure Chest craft activity in my Year 3 Library lessons this week – making sure that some treasured books are included, of course! Thanks for your lovely comment, Karen! We hope this resource works out well in your Library lesson. wow you guys are amazing, thank you so much. I would not have time to think of these ideas!! You’re most welcome Cheriee! 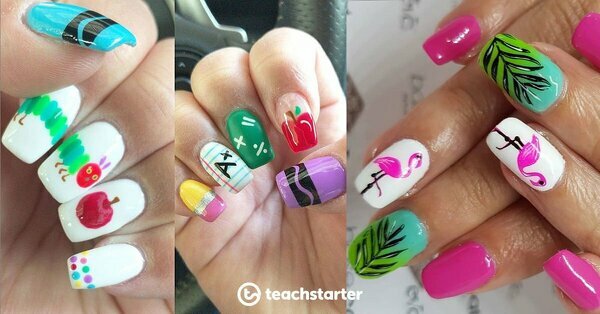 So glad that you like these ideas and I hope your students enjoy them too. Thank you so much for all these wonderful ideas. You are constantly proving to be an asset. You’re most welcome Julie. So glad that you like these ideas. Enjoy Book Week! Love the treasure mapping activity and the poster. Thankyou. I only see 7 ideas not 23. Am i missing something? Hi Kelli, if you have a look at the Book Week task cards there are 16 different activity ideas within that resource. I absolutely love thee ideas! In particular, the QR code activity! Thank you! You’re most welcome Hannah. So glad that you like these resources, thanks for the lovely feedback. Hi Melisa, thank you for your kind feedback. We are so glad that you found these resources helpful during Book Week.